This booklet contains the information you will need to obtain your license. The law that governs your profession is found in the Code of Virginia, 1950, as amended, in Title 54.1, Chapter 7. That law permits the Department of Professional and Occupational Regulation to issue regulations that tell you more about what is expected of you in your profession. This booklet contains a copy of the regulations that you will need to know and obey to get and keep your license. BE SURE YOU READ AND UNDERSTAND THE STANDARDS OF PRACTICE AND CONDUCT. YOUR FAILURE TO OBEY THESE STANDARDS COULD RESULT IN A MONETARY PENALTY OR LOSS OF YOUR LICENSE. CHAPTER 70. REGULATIONS – ESTHETICS PART I. The following words and terms when used in this chapter shall have the following meanings unless the context clearly indicates otherwise. All terms defined in Chapter 7 (§ 54.1-700 et seq.) of Title 54.1 of the Code of Virginia are incorporated in this chapter. "Business entity" means a sole proprietorship, partnership, corporation, limited liability company, limited liability partnership, or any other form of organization permitted by law. "Credit hour" means a combination of the number of hours in class each week and the number of hours per week in a laboratory by which a school may measure its course work. One unit of credit equals one hour of classroom study, two hours of laboratory experience or three hours of internship or practicum or a combination of the three times the number of weeks in the term. Emerging delivery methodologies may necessitate a unit of undergraduate credit to be measured in nontime base methods. These courses shall use the demonstration of competency, proficiency, or fulfillment of learning outcomes to ensure these courses are equivalent to traditionally delivered courses. "Direct supervision" means that a Virginia licensed esthetician or master esthetician shall be present in the esthetics spa or esthetics school at all times when services are being performed by a temporary license holder or student. "Endorsement" means a method of obtaining a license by a person who is currently licensed in another state or jurisdiction. 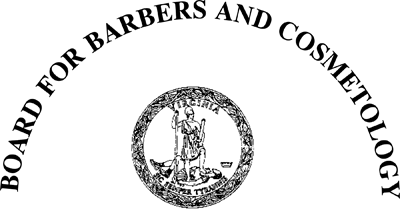 Board for Barbers and Cosmetology, as defined in § 54.1-700 of the Code of Virginia. "Post-secondary educational level" means an accredited college or university that is approved or accredited by the Southern Association of Colleges and Schools Commission on Colleges or by an accrediting agency that is recognized by the U.S. Secretary of Education. "Reinstatement" means having a license restored to effectiveness after the expiration date has passed. "Renewal" means continuing the effectiveness of a license for another period of time. Individuals in other business entities recognized under the laws of the Commonwealth as having a fiduciary responsibility to the firm. "Sole proprietor" means any individual, not a corporation, who is trading under his own name or under an assumed or fictitious name pursuant to the provisions of §§ 59.1-69 through 59.1-76 of the Code of Virginia. "Virginia state institution" for the purposes of this chapter means any institution approved by the Virginia Department of Education. Derived from Volume 23, Issue 25, eff. September 20, 2007; amended, Virginia Register Volume 33, Issue 08, February 1, 2017. 18 VAC 41-70-20. General Requirements for an Esthetician License or Master Esthetician License. The applicant shall be in good standing as a licensed esthetician in Virginia and all other jurisdictions where licensed. The applicant shall disclose to the board at the time of application for licensure any disciplinary action taken in Virginia and all other jurisdictions in connection with the applicant's practice as an esthetician. This includes monetary penalties, fines, suspensions, revocations, surrender of a license in connection with a disciplinary action, or voluntary termination of a license. The applicant shall disclose to the board at the time of application for licensure whether he has been previously licensed in Virginia as an esthetician or master esthetician. Upon review of an applicant's prior disciplinary action, the board, in its discretion, may deny licensure to any applicant wherein it deems the applicant is unfit or unsuited to engage in esthetics or master esthetics. The board will decide each case by taking into account the totality of the circumstances. Any plea of nolo contendere or comparable plea shall be considered a disciplinary action for the purposes of this section. The applicant shall provide a certified copy of a final order, decree, or case decision by a court, regulatory agency, or board with the lawful authority to issue such order, decree, or case decision, and such copy shall be admissible as prima facie evidence of such disciplinary action. The applicant shall disclose his physical address. A post office box is not acceptable. The applicant shall sign, as part of the application, a statement certifying that the applicant has read and understands the Virginia esthetics license laws and this chapter. All felony convictions within 20 years of the date of application. Any plea of nolo contendere shall be considered a conviction for purposes of this subsection. The record of a conviction received from a court shall be accepted as prima facie evidence of a conviction or finding of guilt. The board, in its discretion, may deny licensure to any applicant in accordance with § 54.1-204 of the Code of Virginia. The applicant shall provide evidence satisfactory to the board that the applicant has passed the board-approved examination requirement administered either by the board or by independent examiners. Eligibility to sit for board-approved examination. Training in the Commonwealth of Virginia. Any person completing an approved esthetics training program or a master esthetics training program in a Virginia licensed esthetics school shall be eligible for the applicable examination. Training outside of the Commonwealth of Virginia. Any person completing esthetics training that is substantially equivalent to the Virginia program but is outside of the Commonwealth of Virginia must submit to the board documentation of the successful completion of training to be eligible for examination. If less than the required hours of esthetics training was completed, an applicant must submit a certificate, diploma, or other documentation acceptable to the board verifying the completion of a substantially equivalent esthetics course and documentation of six months of work experience as an esthetician in order to be eligible for the esthetician examination. 18 VAC 41-70-30. License by Endorsement. Upon proper application to the board, any person currently licensed to practice as an esthetician or master esthetician in any other state or jurisdiction of the United States and who has completed both a training program and a written examination and a practical examination that are substantially equivalent to those required by this chapter may be issued an esthetician or master esthetician license without an examination. The applicant must also meet the requirements set forth in 18VAC41-70-20 A. 18 VAC 41-70-35. Apprenticeship Training. Licensed estheticians and master estheticians who train apprentices shall comply with the standards for apprenticeship training established by the Division of Registered Apprenticeship of the Virginia Department of Labor and Industry and the Virginia Board for Barbers and Cosmetology. Owners of esthetics spas who train apprentices shall comply with the standards for apprenticeship training established by the Division of Registered Apprenticeship of the Virginia Department of Labor and Industry. Any person completing the Virginia apprenticeship program in esthetics or master esthetics shall be eligible for examination. Derived from Volume 33, Issue 08, eff. February 1, 2017. 18 VAC 41-70-40. Examination Requirements and Fees. Applicants for initial licensure shall pass both a written examination and a practical examination approved by the board. The examinations may be administered by the board or by a designated testing service. Any applicant who passes one part of the examination shall not be required to take that part again provided both parts are passed within one year of the initial examination date. Any candidate failing to appear as scheduled for examination shall forfeit the examination fee. The fee for examination or reexamination is subject to contracted charges to the board by an outside vendor. These contracts are competitively negotiated and bargained for in compliance with the Virginia Public Procurement Act (§ 2.2-4300 et seq. of the Code of Virginia). Fees may be adjusted and charged to the candidate in accordance with these contracts. The fee shall not exceed $225 per candidate. Any candidate failing to apply for initial licensure within five years of passing both a written examination and a practical examination shall be required to retake both portions. Records of examinations shall be maintained for a maximum of five years. 18 VAC 41-70-50. Reexamination Requirements. Any applicant who does not pass a reexamination within one year of the initial examination date shall be required to submit a new application and examination fee. Derived from Volume 23, Issue 25, eff. September 20, 2007. 18 VAC 41-70-60. Examination Administration. The examination shall be administered by the board or the designated testing service. The practical examination shall be supervised by a chief examiner. Every esthetics or master esthetics examiner shall hold a current Virginia license in his respective profession, have three or more years of active experience as a licensed professional, and be currently practicing in that profession. Examiners shall attend training workshops sponsored by the board or by a testing service acting on behalf of the board. No certified esthetics or master esthetics instructor who (i) is currently teaching, (ii) is a school owner, or (iii) is an apprentice sponsor shall be an examiner. Each	esthetics or master esthetics chief examiner shall (i) hold a current Virginia license in his respective profession, (ii) have five or more years of active experience in that profession, (iii) have three years of active experience as an examiner, and (iv) be currently practicing in his respective profession. Chief examiners shall attend training workshops sponsored by the board or by a testing service acting on behalf of the board. The applicant shall follow all procedures established by the board with regard to conduct at the examination. Such procedures shall include written instructions communicated prior to the examination date and instructions communicated at the site, either written or oral, on the date of the examination. Failure to comply with all procedures established by the board and the testing service with regard to conduct at the examination may be grounds for denial of application. 18 VAC 41-70-70. Esthetician Temporary License. A temporary license to work under the direct supervision of a currently licensed esthetician or master esthetician may be issued only to applicants for initial licensure that the board finds eligible for the applicable examination. There shall be no fee for a temporary license. The temporary license shall remain in force for 45 days following the examination date. The examination date shall be the first test date after the applicant has successfully submitted an application to the board. Any person continuing to practice esthetics services after a temporary license has expired may be prosecuted and fined by the Commonwealth under §§ 54.1-111 A 1 and 54.1-202 of the Code of Virginia. No applicant for examination shall be issued more than one temporary license. Temporary permits shall not be issued where grounds may exist to deny a license pursuant to § 54.1- 204 of the Code of Virginia or 18VAC41-70-20. 18 VAC 41-70-80. General Requirements for a Spa License. The applicant, and all members of the responsible management, shall be in good standing as a licensed spa in Virginia and all other jurisdictions where licensed. The applicant and all members of the responsible management shall disclose to the board at the time of application for licensure, any disciplinary action taken in Virginia and all other jurisdictions in connection with the applicant's operation of any esthetics spa or practice of the profession. This includes monetary penalties, fines, suspensions, revocations, surrender of a license in connection with a disciplinary action, or voluntary termination of a license. The applicant shall disclose to the board at the time of application for licensure if the applicant or any member of responsible management has been previously licensed in Virginia as an esthetics spa. Upon review of the applicant's and all members of the responsible management's prior disciplinary action, the board, in its discretion, may deny licensure to any applicant wherein it deems the applicant is unfit or unsuited to engage in the operation of an esthetics spa. The board will decide each case by taking into account the totality of the circumstances. Any plea of nolo contendere or comparable plea shall be considered a disciplinary action for the purposes of this section. The applicant shall provide a certified copy of a final order, decree, or case decision by a court, regulatory agency, or board with the lawful authority to issue such order, decree, or case decision, and such copy shall be admissible as prima facie evidence of such disciplinary action. The applicant shall disclose the firm's responsible management. Shop or salon licenses are issued to firms as defined in this chapter and shall not be transferable and shall bear the same name and address of the business. Any changes in the name or address of the spa shall be reported to the board in writing within 30 days of such changes. The board shall not be responsible for the licensee's, certificate holder's, or permit holder's failure to receive notices, communications, and correspondence caused by the licensee's, certificate holder's, or permit holder's failure to promptly notify the board in writing of any change of name or address or for any other reason beyond the control of the board. Conversion, formation, or dissolution of a corporation, a limited liability company, or association, or any other business entity recognized under the laws of the Commonwealth of Virginia. Any change in the officers of a corporation, managers of a limited liability company, or officers or directors of an association shall be reported to the board in writing within 30 days of the change. The board or any of its agents shall be allowed to inspect during reasonable hours any licensed shop or salon for compliance with provisions of Chapter 7 (§ 54.1-700 et seq.) of Title 54.1 of the Code of Virginia or this chapter. For purposes of a board inspection, "reasonable hours" means the hours between 9 a.m. and 5 p.m.; however, if the licensee generally is not open to the public substantially during the same hours, "reasonable hours" shall mean the business hours when the licensee is open to the public. 18 VAC 41-70-90. General Requirements for a School License. The applicant and all members of the responsible management shall be in good standing as a licensed school in Virginia and all other jurisdictions where licensed. The applicant and all members of the responsible management shall disclose to the board at the time of application for licensure, any disciplinary action taken in Virginia and all other jurisdictions in connection with the applicant's operation of any esthetics school or practice of the profession. This includes monetary penalties, fines, suspensions, revocations, surrender of a license in connection with a disciplinary action, or voluntary termination of a license. The applicant shall disclose to the board at the time of application for licensure if the applicant or any member of the responsible management has been previously licensed in Virginia as an esthetics school. Upon review of the applicant's and all members of the responsible management's prior disciplinary action, the board, in its discretion, may deny licensure to any applicant wherein it deems the applicant is unfit or unsuited to engage in the operation of an esthetics school. The board will decide each case by taking into account the totality of the circumstances. Any plea of nolo contendere or comparable plea shall be considered a disciplinary action for the purposes of this section. The applicant shall provide a certified copy of a final order, decree, or case decision by a court, regulatory agency, or board with the lawful authority to issue such order, decree, or case decision, and such copy shall be admissible as prima facie evidence of such disciplinary action. Esthetics school licenses are issued to firms as defined in this chapter and shall not be transferable and shall bear the same name and address as the school. Any changes in the name or the address of record or principal place of business of the school shall be reported to the board in writing within 30 days of such change. The board shall not be responsible for the licensee's, certificate holder's, or permit holder's failure to receive notices, communications, and correspondence caused by the licensee's, certificate holder's, or permit holder's failure to promptly notify the board in writing of any change of name or address or for any other reason beyond the control of the board. The name of the school must indicate that it is an educational institution. All signs or other advertisements must reflect the name as indicated on the license issued by the board and contain language indicating it is an educational institution. Conversion, formation, or dissolution of a corporation, a limited liability company, an association, or any other business entity recognized under the laws of the Commonwealth of Virginia. Barber schools, cosmetology schools, nail schools, or waxing schools under the Virginia Department of Education shall be exempted from licensure requirements. The board or any of its agents shall be allowed to inspect during reasonable hours any licensed school for compliance with provisions of Chapter 7 (§ 54.1-700 et seq.) of Title 54.1 of the Code of Virginia or this chapter. For purposes of a board inspection, "reasonable hours" means the hours between 9 a.m. and 5 p.m.; however, if the licensee generally is not open to the public substantially during the same hours, "reasonable hours" shall mean the business hours when the licensee is open to the public. 18 VAC 41-70-100. General Requirements for an Esthetics Instructor Certificate. Instructors shall be required to maintain a Virginia esthetician license. 18 VAC 41-70-110. General Requirements for a Master Esthetics Instructor Certificate. The applicant shall be in good standing as a licensed master esthetician in Virginia and all other jurisdictions where licensed. The applicant shall disclose to the board at the time of application for licensure any disciplinary action taken in Virginia and all other jurisdictions in connection with the applicant's practice as a master esthetician. This includes monetary penalties, fines, suspensions, revocations, surrender of a license in connection with a disciplinary action, or voluntary termination of a license. The applicant shall disclose to the board at the time of application for licensure if the applicant has been previously licensed in Virginia as an esthetician or master esthetician. Instructors shall be required to maintain a Virginia master esthetician license. 18 VAC 41-70-140. License renewal required. A license or certificate issued under this chapter shall expire two years from the last day of the month in which it was issued. 18 VAC 41-70-150. Notice of renewal. The Department of Professional and Occupational Regulation will mail a renewal notice to the licensee outlining the procedures for renewal. Failure to receive this notice, however, shall not relieve the licensee of the obligation to renew. If the licensee fails to receive the renewal notice, a copy of the old license may be submitted as evidence of intent to renew, along with the required fee. 18 VAC 41-70-160. Failure to renew. When a licensee fails to renew its license within 30 days following its expiration date, the licensee shall apply for reinstatement of the license by submitting to the Department of Professional and Occupational Regulation a reinstatement application and renewal fee and reinstatement fee. When a licensee fails to renew its license within two years following the expiration date, reinstatement is no longer possible. To resume practice, the former licensee shall apply for licensure as a new applicant and shall meet all current entry requirements for each respective license. Individuals applying for licensure under this section shall be eligible to apply for a temporary license from the board under 18VAC41-70-70. The application for reinstatement for a school shall provide (i) the reasons for failing to renew prior to the expiration date and (ii) a notarized statement that all students currently enrolled or seeking to enroll at the school have been notified in writing that the school's license has expired. All of these materials shall be called the application package. Reinstatement will be considered by the board if the school consents to and satisfactorily passes an inspection of the school and if the school's records are maintained in accordance with 18VAC41-70-230 and 18VAC41-70-240. Upon receipt of the reinstatement fee, application package, and inspection results, the board may reinstate the school's license or require requalification or both. If the reinstatement application package and reinstatement fee are not received by the board within six months following the expiration date of the school's license, the board will notify the testing service that prospective graduates of the unlicensed school are not acceptable candidates for the examination. Such notification will be sent to the school and must be displayed in a conspicuous manner by the school in an area that is accessible to the public. No student shall be disqualified from taking the examination because the school was not licensed for a portion of the time the student attended if the school license is reinstated by the board. The date a renewal fee is received by the Department of Professional and Occupational Regulation or its agent will be used to determine whether the requirement for reinstatement of a license is applicable and an additional fee is required. When a license is reinstated, the licensee shall have the same license number and shall be assigned an expiration date two years from the previous expiration date of the license. A licensee that reinstates its license shall be regarded as having been continuously licensed without interruption. Therefore, a licensee shall be subject to the authority of the board for activities performed prior to reinstatement. A licensee that fails to reinstate its license shall be regarded as unlicensed from the expiration date of the license forward. Nothing in this chapter shall divest the board of its authority to discipline a licensee for a violation of the law or regulations during the period of time for which the individual or business entity was licensed. Derived from Volume 23, Issue 25, eff. September 20, 2007; repealed, Virginia Register Volume 33, Issue 08, February 1, 2017. 18 VAC 41-70-180. General requirements. Hold a school license for each and every location. Hold a spa license if the school receives compensation for services provided in its clinic. For esthetics courses, employ a staff of licensed and certified esthetics instructors or licensed and certified master esthetics instructors. For master esthetics courses, employ a staff of licensed and certified master esthetics instructors. Develop individuals for entry-level competency in esthetics. Submit its curricula for board approval. Esthetician curricula shall be based on a minimum of 600 clock or equivalent credit hours and shall include performances in accordance with 18VAC41-70-190. Master esthetician curricula shall be based on a minimum of 600 clock or equivalent credit hours and shall include performances in accordance with 18VAC41-70-190 C. All changes to curricula must be resubmitted and approved by the board. Inform the public that all services are performed by students if the school receives compensation for services provided in its clinic by posting a notice in the reception area of the spa in plain view of the public. Conduct classroom instruction in an area separate from the clinic area where practical instruction is conducted and services are provided. 18 VAC 41-70-190. Curriculum and Hours of Instruction Requirements. Each esthetics school shall submit with its application a curriculum including, but not limited to, a course syllabus, a detailed course content outline, a sample of five lessons plans, a sample of evaluation methods to be used, and a breakdown of hours or credit hours and performances for all courses to be taught that will lead to licensure or certification. In addition, if a school awards credit in accordance with subsection D of this section, the school shall submit copies of the assessment policy, method of evaluation of transcripts and the examination to be used in making the assessment. Orientation and business topics - minimum of 25 hours of instruction. Laws and regulations - minimum of 10 hours of instruction. General sciences - minimum of 80 hours of instruction. Applied sciences - minimum of 95 hours of instruction. Diseases and disorders of the skin. Skin care - minimum of 255 hours of instruction. General procedures and safety measures. Makeup - minimum of 65 hours of instruction. Body and other treatments - minimum of 20 hours of instruction. Hair removal - minimum of 50 hours of instruction. Orientation, advanced business subjects, and infection control - minimum of 45 hours of instruction. State laws, rules and regulations - minimum of 10 hours of instruction. Advanced anatomy and physiology - minimum of 65 hours of instruction. Advanced skin care and advanced modalities - minimum of 90 hours of instruction. Pretreatment and posttreatment for microdermabrasion. Advanced procedures and chemical exfoliation - minimum of 270 hours of instruction. Pretreatment and posttreatment for trichloracetic acid peels. Lymphatic drainage - minimum of 120 hours of instruction. A licensed esthetics school with an approved esthetics program may conduct an assessment of a student's competence in esthetics and, based on the assessment, give a maximum of 300 hours credit towards the requirements specified in subsection B of this section and 18VAC41-70-200 A. A licensed esthetics school with an approved master esthetics program may conduct an assessment of a student's competence in master esthetics and, based on the assessment, give a maximum of 300 hours credit towards the requirements specified in subsection C of this section and 18VAC41-70-200 B. The school shall make the assessment based on a review of the student's transcript and the successful completion of a board-approved competency examination administered by the school. The school may also request a copy of a catalog or bulletin giving the full course description when making the evaluation. The number of credit hours awarded shall not exceed the actual hours of instruction verified on the transcript or the number of hours specified in the board-approved curriculum for a specific topic. 18 VAC 41-70-200. Practical Performance Requirements. 18 VAC 41-70-210. School Equipment. For an esthetics course, an esthetics school must have at least one treatment table, one magnifier lamp, one steamer, one adjustable stool, and one table for instruments and products for each two students enrolled in the class. For each procedure taught in the esthetics curriculum, the esthetics school must have at least one set of the applicable equipment for each three students enrolled in the class. For a master esthetics course, an esthetics school must have at least one treatment table, one woods lamp, one adjustable stool, and one table for instruments and products for each two students enrolled in the class. For each procedure taught in the master esthetics curriculum, the esthetics school must have at least one set of the applicable equipment for each six students enrolled in the class. All other relevant documents that account for a student's accrued clock hours and practical applications. Schools shall produce to the board or any of its agents, within 10 days of the request, any document, book, or record concerning any student, or for which the licensee is required to maintain records, for inspection and copying by the board or its agents. The board may extend such timeframe upon a showing of extenuating circumstances prohibiting delivery within such 10-day period. Schools shall, within 21 days upon receipt of a written request from a student, provide documentation of hours and performances completed by the student as required to be maintained by subsection A of this section. Prior to a school changing ownership or a school closing, the school is required to provide to current students documentation of hours and performances completed. For a period of one year after a school changes ownership, the school shall provide, within 21 days upon receipt of a written request from a student, documentation of hours and performances completed by a current student. Schools shall provide, in a manner, format, and frequency prescribed by the board, a roster of all current students and a roster of students who attended in the preceding six months prior to the reporting deadline. Within 30 days of ceasing to operate, whether through dissolution or alteration of the business entity, the school shall provide a written report to the board on performances and hours of each of its students who has not completed the program. PART VI. STANDARDS OF PRACTICE. 18 VAC 41-70-250. Scope of Practice. Each licensed spa or school shall ensure that no licensee or student performs any service beyond the scope of practice for the esthetician or master esthetician license. 18 VAC 41-70-260. Display of License. Each licensed spa or school shall ensure that all current licenses and temporary licenses issued by the board shall be displayed in plain view of the public either in the reception area or at individual work stations of the spa or school. Duplicate licenses or temporary licenses shall be posted in a like manner in every spa or school location where the licensee or temporary license holder provides services. All licensees and temporary license holders shall operate under the name in which the license or temporary license is issued. All apprenticeship cards issued by the Department of Labor and Industry (DOLI) shall be displayed in plain view of the public either in the reception area or at individual work stations of the shop or salon. The apprentice sponsor shall require each apprentice to wear a badge clearly indicating his status as a DOLI registered apprentice. 18 VAC 41-70-270. Sanitation and Safety Standards for Spas and Schools. Any spa or school where esthetics services are delivered to the public must be clean and sanitary at all times. Compliance with these rules does not confer compliance with other requirements set forth by federal, state, and local laws, codes, ordinances, and regulations as they apply to business operation, physical construction and maintenance, safety, and public health. Licensees shall take sufficient measures to prevent the transmission of communicable and infectious diseases and comply with the sanitation standards identified in this section and shall ensure that all employees likewise comply. Disinfection and storage of implements. A wet disinfection unit is a container large enough to hold a disinfectant solution in which the objects to be disinfected are completely immersed. A wet disinfection unit must have a cover to prevent contamination of the solution. The solution must be a hospital grade and tuberculocidal disinfectant solution registered with the U.S. Environmental Protection Agency (EPA). Disinfectant solutions shall be used according to manufacturer's directions. After immersion, rinse articles, thoroughly dry with a clean paper towel, and store in a clean predisinfected and dry cabinet, drawer, or nonairtight covered container, or leave instruments in an EPA-registered disinfection storage solution used according to manufacturer's directions. Single-use items designed by the manufacturer for use on no more than one client should be discarded immediately after use on each individual client, including powder puffs, lip color, cheek color, sponges, styptic pencils, or nail care implements. The disinfection and reuse of these items is not permitted and the use of single-use items on more than one client is prohibited. For the purpose of recharging, rechargeable tools or implements may be stored in an area other than in a closed cabinet or container. This area shall be clean. All materials including cosmetic and nail brushes, sponges, chamois, spatulas, and galvanic electrodes must be cleaned with warm water and soap or detergent to remove all foreign matter. Implements should then be rinsed, thoroughly dried with a clean paper towel, and completely immersed in an EPA-registered hospital grade and tuberculocidal disinfectant solution. Such implements shall be soaked for 10 minutes or more, removed, rinsed, dried thoroughly, and stored in a predisinfected and dry drawer, cabinet or nonairtight covered container, or left in an EPA-registered disinfection storage solution used according to manufacturer's directions. All wax pots shall be cleaned and disinfected with an EPA-registered hospital grade and tuberculocidal disinfectant solution with no sticks left standing in the wax at any time. The area immediately surrounding the wax pot shall be clean and free of clutter, waste materials, spills, and any other items that may pose a hazard. Each esthetician must have a wet disinfection unit at his station. Nail brushes; nippers; finger bowls; disinfectable or washable buffers; disinfectable or washable files, which must also be scrubbed with a brush to remove all foreign matter; and other instruments must be washed in soap and water, rinsed, thoroughly dried with a clean paper towel, and then completely immersed in an EPA-registered hospital grade and tuberculocidal disinfectant solution for 10 minutes after each use. After disinfection they must be rinsed, dried thoroughly with a clean paper towel, and placed in a dry, predisinfected, nonairtight covered receptacle, cabinet, or drawer, or left in an EPA-registered disinfectant storage system used according to manufacturer's directions. Wipe dry with a clean towel. General sanitation and safety requirements. Adequate lighting shall be provided. Any disposable material making contact with blood or other body fluid shall be disposed of in a sealed plastic bag and removed from the spa or school in accordance with the guidelines of the Virginia Department of Health and OSHA (Occupational Safety and Health Administration). Chemical storage and emergency information. Chemicals that could interact in a hazardous manner (e.g., oxidizers, catalysts, and solvents) shall be labeled and separated in storage. Esthetics spas must be in compliance with current building and zoning codes. In addition to the requirements set forth in this section, all licensees and temporary license holders shall adhere to regulations and guidelines established by the Virginia Department of Health and the Occupational and Safety Division of the Virginia Department of Labor and Industry. All spas and schools shall immediately report the results of any inspection of the spa or school by the Virginia Department of Health as required by § 54.1-705 of the Code of Virginia. All spas and schools shall conduct a self-inspection on an annual basis and maintain a self-inspection form on file for five years so that it may be requested and reviewed by the board at its discretion. 18 VAC 41-70-280. Grounds for license revocation or suspension; denial of application, renewal or reinstatement; or imposition of a monetary penalty. Fails to comply with all procedures established by the board and the testing service with regard to conduct at any board examination.